Learn a new skill or brush up on your technique with this fun and informative jewellery making workshop! Students will learn the basic technique of wire-wrapping for jewellery making. This will also include an introduction to the tools and their usage. Depending on ability, students will make and take home at least a pair of earrings, if not a pair of earrings and a bracelet. Come with friends or make some new ones. All abilities welcome! 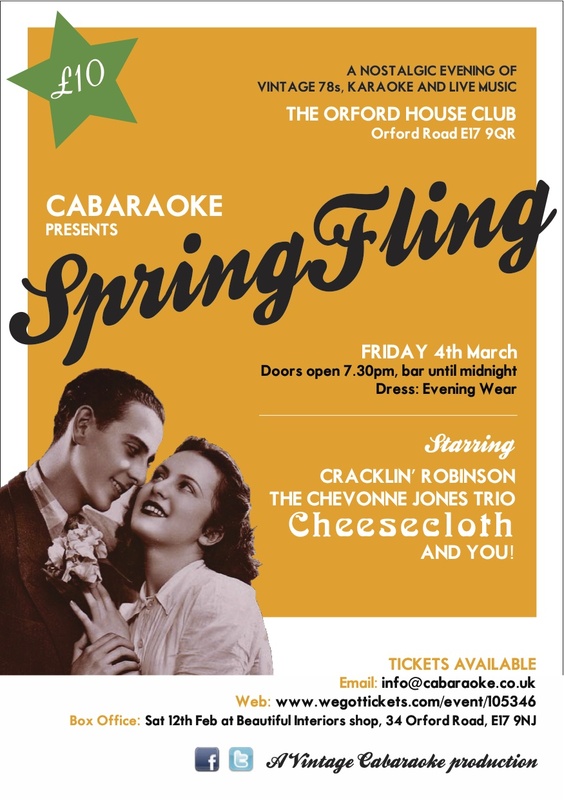 Yes,that's right, they're back on Friday 4th of March for another fling! 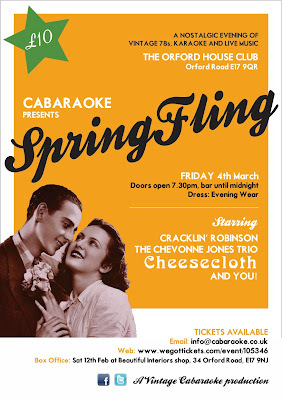 Join the lovely guys and gals at the Vintage Cabaraoke for another fun filled evening at one of our favourite venues! Orford House Social Club is a little gem situated in the Village quarter of Walthamstow rich in old time glamour and pure jollity!!! Thursday 10th of February Ye Olde Rose & Crown Theater Pub 55 Hoe Street Walthamstow London...a hop and a skip from the tube/bus station! 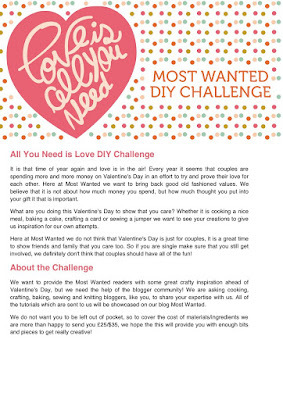 Join the Craft Guerrilla for our monthly d.i.y. craft night! Pop in and socialize with other craft loving people,make and enjoy learning a new craft skill. You can either join the mini workshop (details below) or get yourself a ready to make craft pack available to purchase on the night. 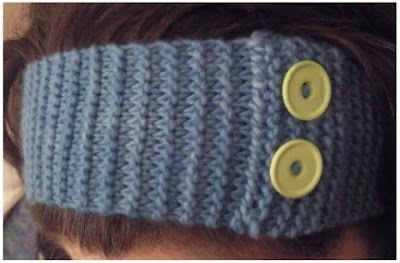 Make your own knitted head band! Vanessa Hubbard will teach you to cast on,use the knit stitch,cast off and weave in ends! Sounds like Chinese to you? Then you really should join this great mini workshop and learn the principals of knitting!!! The project is a simple headband that can be dressed up with buttons,beads or embroidered. You will be able to take your finished item home with you, and if you haven't finished it, there will be further support available via email. Wowzers, not what isn't there to like? The mini work shop costs £12 per participant which includes needles and yarn. Vanessa has been knitting since the age of 3 (she's now 44)! "My mother discovered it would keep me quiet for hours at a time. Since then I have always been crafty. Mostly with knitting,but I can crochet,sew,paper craft, cross stitch,quilt..."
Sounds to me like Nessa is a one woman crafting machine! WANTED a very talented guy or gal that will be able to collate our next issue, a few illustrators and contributors! We'll supply the content, hand over a few pages for you to feature your work or the work* of your creative network. This is a great chance to advertise your own work and to link up and access our extensive fan base. Send us your work and we'll feature it in the zine*! Plus as a thank you we'll link your web site/blog to our web site and blog! We'll also link up with you on our blog and web site! Brief: Spring and the joys of crafting! Renewal,recycling,up-cycling,nature,the outdoors and so on. Also to coincide with our Craft Guerrilla book which will be out in early summer so lots of party themed work...It is after all a crafter's party hand book..."craft ideas for every occasion"! Dimensions: A5,16 pages(includes advert page as that's how we fund the printing), black and white professionally printed on coloured paper (yellow). LAYOUT:PAGES must have a bleed and be ready to print!!! Deadline: please contact us asap. Deadlines for submissions are February 13th then all content needs to go to the chosen designer/editor to be collated and sent back to us by February 24th.The Zine is released on the 1st of March. The Zine is available to buy on line in our web shop,at our events or at Beautiful Interiors 34 Orford Rd Walthamstow E17 9NJ. 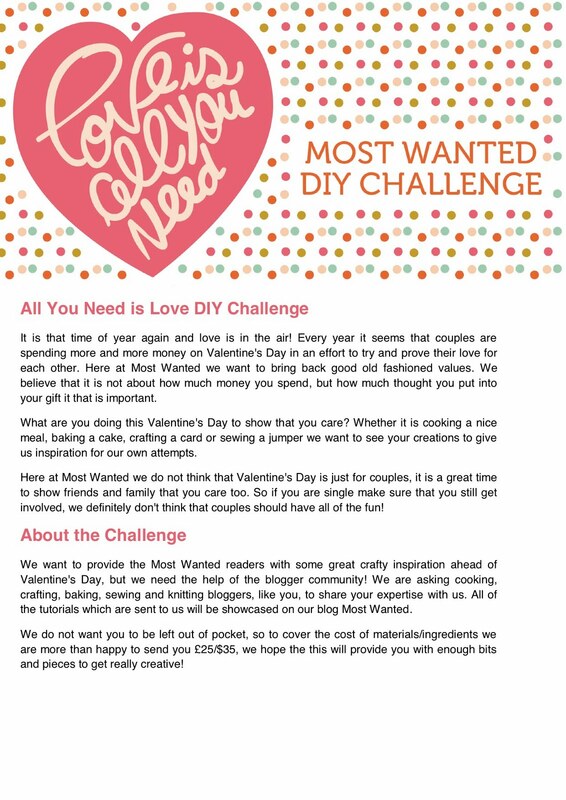 Our friends at vouchercodes.co.uk are on the look out for some crafty ideas for VALENTINES'S. It's a great way to promote your blog and your hand made products...plus make a few pounds from it. As part of the local community Craft Guerrilla are proud to be nominated again for a LOVE YOUR BOROUGH AWARD! Each year the council of Waltham Forest awards groups,individuals and collectives like us for facilitating some form of service to the wider local community. This year we've been nominated under the ARTS AWARDS. Our events have both worked as a spring board for local designer makers enabling many to start up their own creative businesses and collaborations with other artists. Craft Guerrilla have also worked hard to promote the area and it's designers through national and international media from Japan to Australia, online publications, blogs, an exhibition in the CRAFT Werk 2.0 in the Jönköping museum Sweden, reputable international craft communities like Etsy and even BBC2's News Night therefore launching Walthamstow as a place to visit for contemporary, high quality art & craft. In 2010 we were lucky enough to be invited by the Knitting and Stitching shows to exhibit a few designers in London,Harrogate and Dublin. In the spirit of fairness we opened it up as a competition. The criteria was simple: applicants had to make their wares and were serious about transforming their hobby into a real business. We've had a few success stories and we're stoked to have shared this unmissable chance with our fellow creatives! We're really proud of the work we do with designers and most of all we believe in sharing opportunities. It's always been about facilitating, joining forces, strength in numbers and making HAND MADE something regarded with esteem, taken seriously as an art form and treated as a premium product. Our D.I.Y. Craft Nights have also proven to be an important monthly event in people's diary. We get all sorts, all ages, from all over London and from all walks of life but many of our participants especially local elderly and people with mental health problems these events have proven to be an important life line and a way back into the community. We love spreading the crafty word and if it works like a tonic then we're happy we could provide the crafty medicine! As a self funded,grass roots collective we're usually operating on a shoe string budget but thanks to our PR machine we've been able to successfully acheive funding from people like ETSY and CraftNation.com both high profile Craft names.It's an endless job but we feel it's something worth pursuing! If you think we're deserved of an award then please vote for us! *please note that you don't need to be a local resident just provide the information requested including your address. The deadline is the 31st of January so please,please,please vote for CRAFT GUERRILLA!!! and please feel free to give your own reason for nominating us!!! 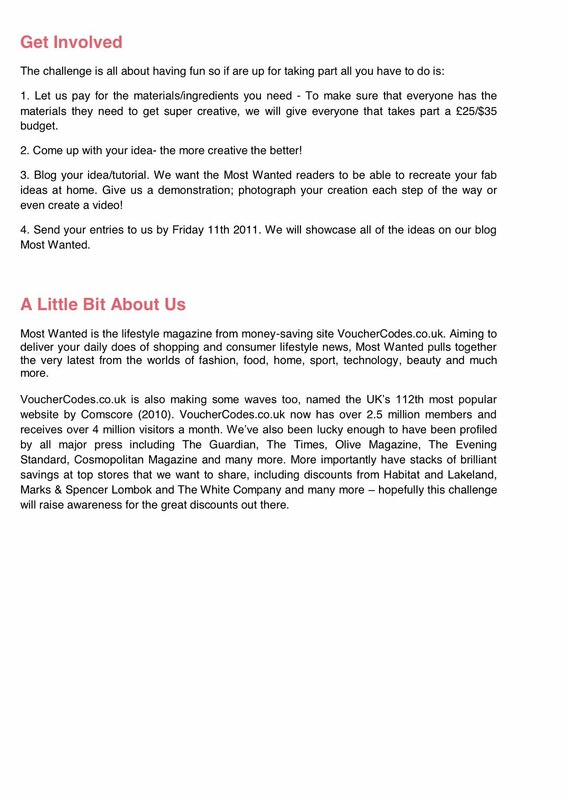 Want to be in our book? Recipe and Music suggestions wanted! 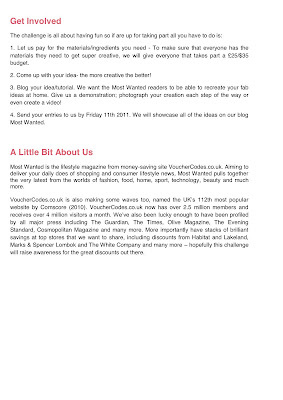 You've heard the rumours, you've seen the pictures of us over-excitedly clutching at our publishing contract in our sweaty paws and now I can confirm with a link to our publishers website that the Craft Guerrilla craft book will be published in June 2011! Here's a link with a bit more information about what the book is all about: http://blackdogonline.com/craft/crafty-ideas-for-every-occasion.html. Now, being as we see ourselves as a Craft Guerrilla army with you our lovely readers as part of that, we want to ask you if you would like to contribute a little something to the book? We're looking for your favourite recipes for crafting sessions or even craft related recipes - you know, button shaped biscuits, balls of wool shaped cupcakes, or delicious but easy dinner recipes that you make so that you can focus on the crafting without worrying about what to cook later, that kind of thing. We're also putting together playlists to go in the book of our favourite crafting tunes. They can be themed such as for birthdays or weddings, or just different types of music you like to listen to when you're working on crafty things. If you'd like to contribute a recipe or some music suggestions then please email craftguerrilla@gmail.com with the subject line: I want to be in your book! by midnight on Monday 31st January. We will then choose the best submissions to go in the book and you will have our undying gratitude forever - plus the chance to point out your suggestion in the book and say to your friends "I suggested that track to them" or "That's my recipe" and feel all proud. Please note that the recipes need to be your own creation - don't go trying to sneak any of Nigella's or Gizzi's past us, we will know! I will be posting this on our facebook page as well so feel free to post your music suggestions there however please do email us your recipe suggestions, don't post them here or on facebook. If you have any questions about it all then drop us a line at craftguerrilla@gmail.com. We look forward to seeing what you come up with, you creatively crafty lot! N.B: We won't be able to reply to everyone who makes a music suggestion but we will definitely contact you if we would like to use your recipe in the book. If you LOVE Valentine's and the William Morris Gallery then you should join us for our LOVE EASY Valentine's Craft market event! An evening market with the best,most gorgeous,inspiring,original hand made gifts available to buy for your sweetie pie!!! We've selected the finest hand made gifts for love birds by London based Designer makers and Artists. Come and browse through the stalls,make your own Valentine's card at the MAKE EASY table,win a hand made prize at the WIN EASY tombola or just enjoy a drink at the pop up SPEAK EASY BAR...where you might even find LOVE! Because we'll be there out of gallery opening hours we've invited a few more designers so it'll be brimming with hand made loveliness. It is really the best place to buy all your valentine's gifts! Plus you'll be helping the gallery as entrance proceeds,tombola and stall fees go directly to the gallery and the refurbishment fund. As you've probably noticed it's a LOVE EASY because of the theme...IE 1920's Americana and the Speak Easy culture. Shopping for Valentine's gifts needn't be hard that's why with your LOVE of CRAFT and hand made gifts while supporting beautiful Galleries like the WMG you can shop til you drop in one place...that's why it's EASY! So if you'd like to dress up in the fashion please do...I will! It's official Craft Guerrilla are hosting an event for the lovely people of the Camden Crawl on Sunday May the 1st 2011. We'll be at the Black Heart in Camden from 2-6pm with our Craftivista Social Club. DIY Craft, a Rock a billy band and DJ's will provide a fun event open to all festival goers. Once again the Obscuritones will be providing the music while myself, Louise plus a hand full of helpers will be teaching festival visitors a craft trick or two with our limited edition DIY craft project (free to festival ticket holders). Also the fantastic Jake Holloway and Handsome Betty will be on the decks playing some eclectic tunes from Rock n roll to dirty trashy punk! For tickets please visit the official Camden Crawl web site.